Is Your Vitamin D Serum Level the Best Indicator of Your Cancer Risk? 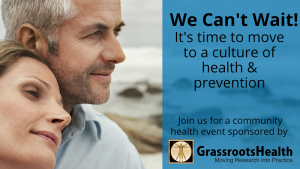 GrassrootsHealth is in the business of moving research into practice. After reading all the research on vitamin D and cancer, even if some of the papers received bad reviews, we conclude that yes – vitamin D level is VERY important. We believe that you should test, not guess, and get your vitamin D level above 40 ng/ml (100 nmol/L) and maybe even above 50 ng/ml (125 nmol/L) to lower overall cancer risk. Why test? Because there is a six-fold variability in how people react to supplementation. We work with 48 international scientists, and one of these is Joan Lappe who has done some great research on vitamin D and cancer. GrassrootsHealth decided to combine the data for women aged 55 years and older from the GrassrootsHealth D*action cohort (N = 1,135, median serum level = 48 ng/ml) with the data from the cohort used in Lappe’s 2007 randomized controlled trial (Lappe 2007, N= 1,169, median serum level = 30 ng/ml). By pooling the data, we were able to have a broader range of serum levels, more data, and thus improved statistical power. We researched and published a paper, with the primary outcome being all invasive cancers combined, excluding skin cancer. 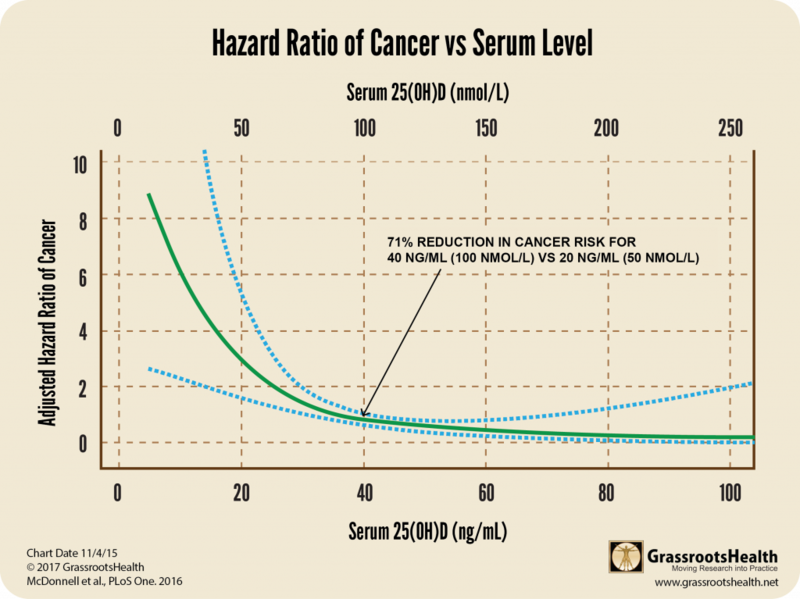 In our analysis, without adjusting for other risk factors, we found that women with a mean vitamin D serum level greater than or equal to 40 ng/ml had a 71% lower risk of cancer than women with serum levels <20 ng/ml (P-value = .02). All of our analyses were based on serum level because GrassrootsHealth knows that supplements can have vastly different effects on people. The graph below shows the plot of cancer incidence (you want to be low) versus vitamin D level (increasing along the horizontal axis). The blue dotted lines are called the ‘confidence interval’, the closer they are to the actual plotted line (green line) the surer we are of the data, meaning the more data points we had in this region to ensure accuracy. Because we used D*action data with the Lappe data, we had a lot of people in the 40-60 ng/ml range (our recommended range) and can say clearly that cancer incidence is much lower when vitamin D levels are within this range. Where would you want to be on this curve? Do you know your vitamin D level? If not, you can test today!